Recently, a report titled, “In-Dash Navigation System Market: Global Industry Analysis 2012-2016 and Forecast 2017-2022”, has been published by Persistence Market Research (PMR), which offers an extensive assessment of the global in-dash navigation system market. In this report, key trends impacting expansion of the market are included, coupled with regional analysis, market segmentation and information on key players thriving for leading position in the market. 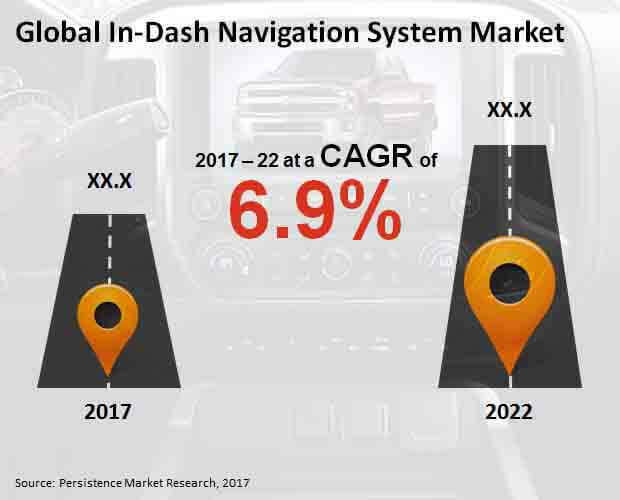 The global market for in-dash navigation systems is being driven by a number of factors including provision of in-dash navigation systems by OEMs in hatch-back vehicles and capability of in-dash navigation systems in reducing fuel consumption. The market is also positively influenced by increasing operational efficiency of vehicles, and emphasis on vehicle production with high fuel-efficiency owing to various new vehicle norms. As regulations on embedded navigation systems increase, OEMs are shifting to in-dash navigation system to comply with end-user demand. Adoption of in-dash navigation systems is also growing on account of rising demand for lightweight vehicle components and surge in production capacity of vehicles in OEMs. The report starts with an executive summary of the market. The executive summary provides a 360o view of the market’s revenue forecasts, analyzing factors which positively as well as negatively influence demand for in-dash navigation systems. In-depth insights regarding factors enhancing uptake of in-dash navigation systems, and factors curbing the market growth are provided in this chapter of the report. Following the executive summary, the next chapter of the report provides an introduction and definition of in-dash navigation system market. For deducing the market size, various aspects based on secondary research are considered in the report. To provide a detailed analysis, the market has been segmented on the basis of sales channel, vehicle type, screen size, display, and region. Along with secondary research, qualitative inputs from primary respondents and in-house panel of industrial experts have been incorporated in the report for arriving at appropriate market estimates. While developing the market forecast, the report focuses on sizing the current market data, which forms the base for future market forecasts. A key feature of report is analysis of in-dash navigation system market, with the provision of corresponding revenue forecasts based on absolute $ opportunity, as it is imperative in the assessment of opportunities sought by providers in the market for identifying and achieving potential resources based on a sales perspective. The report has developed market attractiveness index for understanding performance and growth of key market segments. The final chapter of the report provides a competitive landscape of the market. Key players operating in the market, who are included in the report, are Alpine Electronics Inc., Continental AG, Denso Corporation, Luxoft Holdings Inc., Pioneer Corporation, TomTom NV, Robert Bosch GmbH, Mitsubishi Electric Corp, Garmin International, Delphi Automotive PLC, and Clarion Co. Ltd.
In-dash navigation systems are used for providing information related to traffic, roads and incidents occurring around certain distances from a vehicle. In-dash navigation systems are becoming a standard feature in many models, owing to their numerous benefits. Owing to the busy lifestyle of people, demand for vehicles with in-built provision of real-time traffic information is on a rise. Consumers are also preferring vehicles that are not only aesthically-pleasing but also high on functionality. New vehicle norms imposed by regulatory bodies have encouraged automakers to focus on high-efficiency vehicles. As in-dash navigation systems play an important role in offering information associated with traffic-jams and shortest routes to reach intended destinations, they are being offered as a standard feature in many models. Other major macroeconomic factors influencing the market growth include steady growth in the automobile sector and increasing disposable income of people in developing as well as developed countries. Original equipment manufacturers (OEMs) are concentrating on the provision of embedded and technologically advanced vehicle systems, capable of offering several functions in one unit. OEMs, with highest production capacities of passenger vehicles, are now offering in-dash navigation systems for hatchback vehicles, for gaining consumer popularity and a competitive edge in the market. Moreover, rise in demand for lightweight vehicle components, and legislations for emissions across developed economies are further expected to drive demand for in-dash navigation systems. Persistence Market Research (PMR), in its recent study, projects the global market for in-dash navigation system to register an impressive CAGR throughout the forecast period 2017 to 2022. Revenues from the global in-dash navigation system market are expected to surpass US$ 20,000 Mn by 2022-end. Asia-Pacific excluding Japan (APEJ) is expected to account for nearly one-fourth share of the market, in terms of revenues. Developing APEJ economies such as India and China are estimated to remain lucrative in the market. Europe will remain the largest market for in-dash navigation systems. In-dash navigation system sales will remain steady in North America, on account of surging sales in the US. LCD displays will account for higher sales than high-definition displays, with sales of former expected to reach nearly US$ 7,000 Mn by 2022-end. High-definition displays will witness a higher CAGR, albeit, they will grow from a lower base. In-dash navigation systems are available in a wide range of screen sizes – from 4 inches to nearly 8 inches. Currently, 4 inch screen remains the preferred size, with ‘7 to 7.9’ inches growing at the fastest CAGR. Based on vehicle type, mid-sized passenger cars will remain dominant in the global in-dash navigation systems market, followed by light commercial vehicles and heavy commercial vehicles. However, sales of in-dash navigation systems in compact passenger cars are expected to exhibit the fastest expansion during the forecast period. Although aftermarket is anticipated to remain the largest sales channel for in-dash navigation system, OEM is estimated to register a relatively higher CAGR through 2022. Revenues from sales of in-dash navigation systems in aftermarket are expected to surpass US$ 13,000 Mn by 2022-end. Key players operating in the global market for in-dash navigation systems include Alpine Electronics Inc., Clarion Co. Ltd., Continental AG, Delphi Automotive PLC, Denso Corporation, Garmin International, Luxoft Holdings Inc., Mitsubishi Electric Corp, Pioneer Corporation, Robert Bosch GmbH, and TomTom NV.